The Little Faucet That Could! New Construction needs inspected also and here is another reason why. 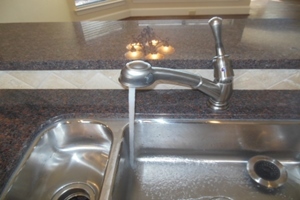 This faucet fail was found in a home that was inspected by our Professional Home Inspector, Paul Crowe, Trec Lic# 20685. We all tend to just look at the parts of the home that appeal to us or tend to overlook the function of the pieces and parts of a home when we are buying. Remember to hire a Fort Worth Home Inspector and get your home, new or old, inspected so you are aware of anything you may need to work on.